Prepared in 45 minutes or less. Dry the short ribs with a paper towel then sprinkle coarse sea salt on all sides. Allow the ribs to rest at room temperature for 20 minutes. Preheat broiler or grill pan. 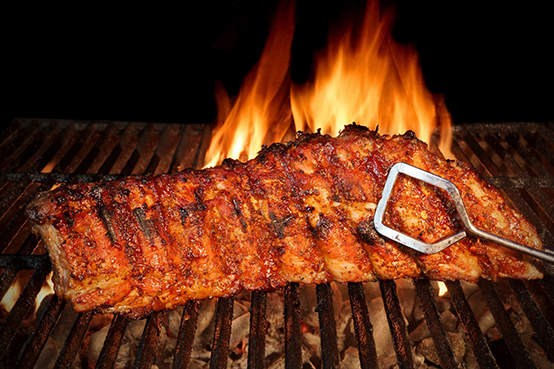 If using a charcoal grill, build a fire with mesquite charcoal, or light a gas grill on high. Place a bowl of tepid water beside the grill. Let the grill heat 15 minutes. If using charcoal, push the heated charcoal to the sides using a small fireplace shovel or stick, to regulate the heat to medium. If using a gas grill, turn it down to medium heat. Next, lay the short ribs bone-side down and let cook for approximately 20 minutes for 3-inch ribs, less for thinner ribs. When small pools, of juice begin to surface on the meat, use tongs to turn them to one meat side and continue grilling for another 5 minutes; then turn to the other meat side for about 5 minutes more, depending on preferred doneness. Argentinean short ribs are usually cooked to medium well. Serve immediately with grilled bread and chimichurri sauce. Serves 4.